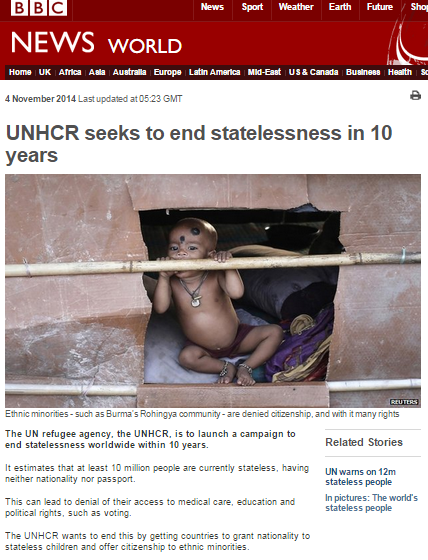 On November 4th the BBC News website published an article titled “UNHCR seeks to end statelessness in 10 years” about the launch of a campaign titled “I Belong“. In so far as it goes the article is fine; an accurate and impartial news report informing BBC audiences about the UNHCR initiative. What is interesting is the part of the story the BBC elected not to tell: the fact that the UN’s campaign to end statelessness does not include Palestinian refugees and their descendants deliberately kept stateless by Arab League countries as part of a political strategy initiated over half a century ago. The [UNHCR] report does not count the case of the Palestinians, since the UN General Assembly had recognized the State of Palestine, Guterres said. The problem for many of the 4.5 million of Palestinians in the West Bank and Gaza and the millions more living as refugees around the world is that the State of Palestine has yet to approve its nationality laws, he said, insisting that this “very specific situation” required a “political solution”. Apparently the BBC did not consider it necessary for its audiences to know that stateless Palestinians will remain pawns in a decades-old battle of political warfare initiated by their Arab League ‘brothers’ and backed by the UN. On January 29th an article appeared in the Middle East section of the BBC News website on the subject of Israel’s refusal to participate in the UN Human Rights Council’s universal periodic review. “Israel has boycotted a regular review by the UN Human Rights Council, the first time any country has done so. 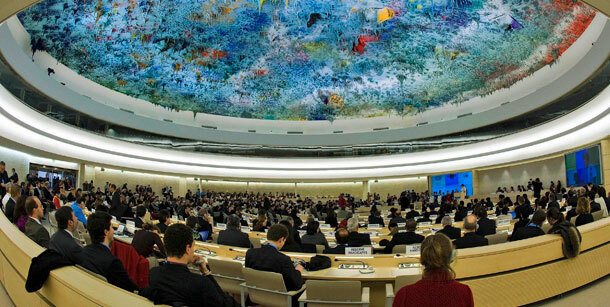 Established in March 2006 to replace the discredited UN Commission of Human Rights, the UN HRC swiftly proved itself to be no better than the body which preceded it. By April 2007 the council had passed nine resolutions condemning Israel – the only country which it specifically condemned. By 2010, the UN HRC has passed 32 resolutions against Israel, with those resolutions forming 48.1% of all the country-specific resolutions. By the end of 2012, the number of resolutions passed by the UN HRC against Israel had risen to 44, with Syria, for example, being the subject of eight resolutions in the same period of time. Israel is the only country for which the UN HRC saw fit to establish a permanent and special agenda item, with another of the council’s ten permanent agenda items reserved for all the 192 other countries together. The council’s Special Rapporteur on the Disputed Palestinian Territories – currently Richard Falk – is the only expert mandate with no date of expiry and its brief covers only Israel’s human rights record. Israel is the only country excluded from membership in the UN regional groups, which means – as explained here – that it cannot take part in some UN activity. “Israel’s is the only UN permanent mission in Geneva denied membership in any of the world body’s five regional groups, a vital element for meaningful participation in UN bodies. Consequently, when the Commission’s fifty-three states, along with the one hundred or so other states that participate as observers, meet in their regional groups to share information on upcoming resolutions or other developments, Israel is the only country left out. Moreover, Israel’s exclusion from full membership in a regional group has effectively prevented it from membership on the Commission. Regimes such as Cuba, Zimbabwe, and Sudan are regularly re-elected. Bizarrely, despite all those well-known facts, the BBC apparently still considers it accurate to write that Israel “claims” to be subject to unfair criticism. “Israel’s action has prompted concern that it might undermine the UN’s human rights work, says the BBC’s Imogen Foulkes in Geneva. Human rights experts fear other countries facing awkward questions might follow suit. “…the Syrian vice-minister of foreign affairs and his entourage took their places in the Council chamber. And then the Cubans said: “the Syrian government is working for the human rights of its people.” The North Koreans said: “we commend Syria on its efforts taken to maintain security and stability.” The Iranians said: “we appreciate the efforts of the government of Syria to promote and protect human rights.” Ditto Sudan, Nicaragua, Venezuela, Algeria, Lebanon, China, Zimbabwe, Burma/Myanmar, and so on. At the time, there were 2,600 dead Syrian citizens at the hands of their own government. And Assad got the message about the human rights bona fides of the UN. It does not, however, bother to inform readers which NGOs made that statement or what their political motivations for doing so might be. Beyond its ‘Israel on the naughty step’ tone, does this BBC article contribute to its audience’s understanding of the reasons behind Israel’s decision not to attend the UPR or the deeply problematic nature of the UN HRC specifically with regard to Israel, as well as in general? Not in the least. And with the UN HRC’s controversial – and tediously predictable – report on Israeli settlements released on January 31st (more on that later), that failure to inform accurately becomes even more significant.